GOVERNOR ROCHAS, STOP OWERRI MARKET DEMOLITIONS NOW! 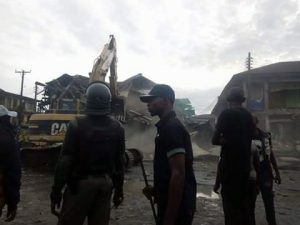 On the morning of Saturday, August 26, 2017, bulldozers accompanied by a horde of armed security operatives, acting on the orders of Imo State Governor, Rochas Okorocha, stormed Eke-Ukwu Owerri Market, and forcefully evicted traders, demolishing their shops, buildings and wares worth millions of Naira. Security operatives, specifically, military men from the 34 Artillery Brigade, Obinze, deployed to maintain law and order during the forceful demolition of the market, shot indiscriminately into the air to prevent any resistance to the demolitions. [SEE VIDEO OF THE SHOOTING] In the process, operatives allegedly shot a ten year old boy, Somtochukwu Ibeanusi, who was trying to assist his parents to evacuate wares trapped inside their shop. A number of Owerri natives who dared to resist the demolitions were shot at, killing two persons while injuring three others. Thousands of traders have lost their livelihoods at a time Nigeria is battling to exit an economic recession.